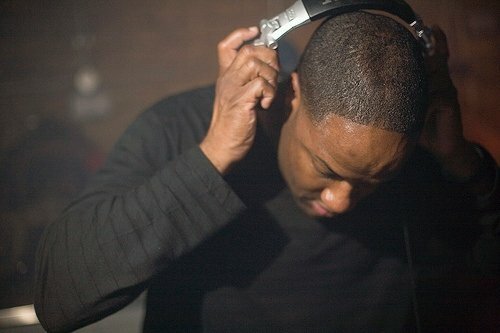 This week we are very happy to present a mix from Keith Worthy, who heads the Aesthetic Audio label out of Detroit. Without much fuss or hype, Keith has been quietly making and releasing some excellent music over the past couple of years. Since starting in 2007, Aesthetic Audio has prioritized quality over quantity: they may have only had 12 releases to date, but they are all very good records. Such an approach feels all the more necessary at a time when it is hard not to be overwhelmed by the never-ending stream of mediocre music flowing into record stores (physical and electronic) every week. So we like what Keith is doing... We got in touch at some point last year after the release of his "Moments In Rhythm Vol 2", one of the strongest deep house records of 2010. And as this new all vinyl mix from Keith clearly shows, the man is not only a good producer, he most definitely knows what to do behind the decks. Providing an upfront selection of new records, Keith has put together a tight, energetic mix of deep house. As usual, we'll post the tracklist for this later. For any of our friends in/near Geneva, you can catch Keith at The Overground Festival, which is from 18th - 21st August. Aesthetic Audio 013 (The Hikari EP) is due in September, and Aesthetic Audio 014 (Moments in Rhythm vol. 3) is set for November. Keith is also working on an album for early 2012. So plenty to look forward to. For more information about Keith and Aesthetic Audio, check the new label homepage. Thanks again to Keith for the mix. Enjoy! what a nice special again, again some very solid deep house sounds, gotta love that second track by delano smith, such a deep roller..
thanks for again a very nice special which is making my day ! Phenomenal Producer / Incredible Label. Nice One !! that track at the 40th min is incredible. heavy! Can't wait to hear this. That ep last year....soooo good. In fact I haven't heard a house record released in recent times anywhere near that. Every track is amazing. I wish this guy could come play daytime lab! This guy right here is a very talented DJ and a top-shelf gentleman as well. Nice mix! the track at 46:00 is insane! sometimes i pass over "deep house" for fear of it being boring, this mix is wonderful. i'm rethinking my stance on deep house, this is some seriously deep and groovey stuff. thanks for sharing with us! I don't comment much, but this is the best mix I've heard in a while. Thanks. What an absolute cracker this mix is. Any chance of the aforementioned tracklist?! Anyone have an id on the last track w/the vocal? Wow this exceptional. Appreciate the restraint, the subtelty of the mix is what makes it really good. Thanks for this. i am not sure how many more times i will have to say this: we do not have the tracklist. we have asked keith for it. as soon as we have it, we will post it. "i am not sure how many more times i will have to say this.."
Unless I'm going crazy, that makes once you said it. perhaps it is here i've only said it once... but i have said probably 7 or 8 times in various places. we'll always post tracklists if we get them. and it is, most definitely, a case of the mondays. you are 110% correct on that! man this mix gets better every time. the back half is just sublime.